To keep birds healthy, it is important to keep feeders and bird baths clean. While many people enjoy feeding birds, improperly maintained feeders can put birds at risk. Birdfeeders and bird baths can serve as reservoirs for several diseases found in birds including salmonellosis, trichomoniasis, aspergillosis, avian pox, and conjunctivitis. If sick birds are noticed at feeders, stop feeding the birds, clean the feeders with a dilute bleach solution (one cup bleach to nine cups water), and wait three to four weeks before feeding the birds again. Properly maintained feeders can help reduce the spread of these diseases. An even better way to attract birds to your yard is to plant a mix of trees, shrubs, and flowers that provide natural food sources, cover, and nesting sites for birds. Providing natural sources of food, rather than stocking bird feeders, will reduce the likelihood of healthy birds coming into close contact with sick birds. 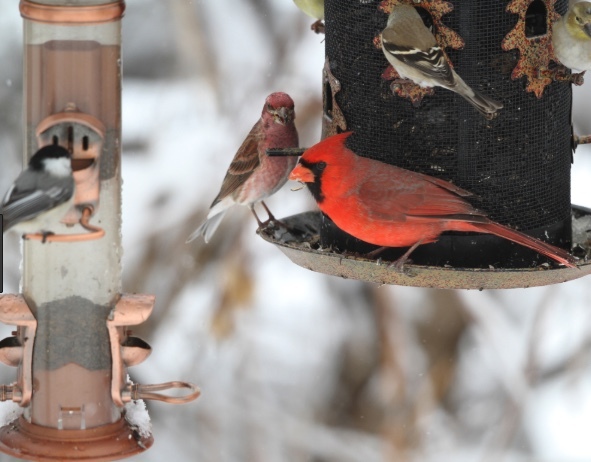 For more information about properly maintaining bird feeders, check out Cornell’s All About Birds.